Reigns in curls with control, definition, soft hold and a shiny, touchable finish with Redken Curvaceous Ringlet. Perfect base to prep curls. - Frizz-free weightless control for curls. - Great base for product layering that prepares curls to take any desired shape. - Creates long-lasting curls with amazing bounce and shine. 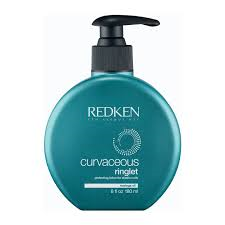 Apply Redken Curvaceous Ringlet to towel-dried hair. Diffuse or air dry for perfect curls.